Mrs. Susan Pringle Weaver, wife of Nathaniel Weaver, died Wednesday at her home in Morrison, Ill., where she had made her home for many years. 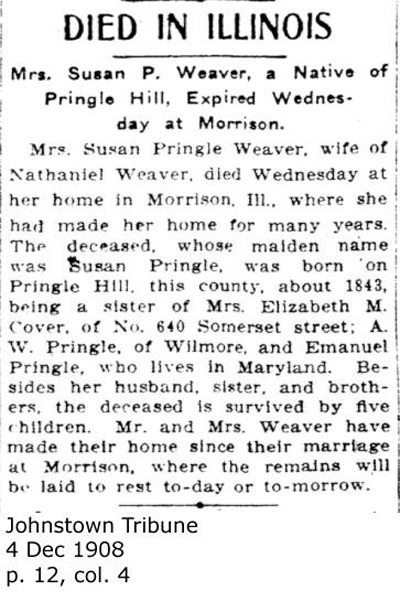 The deceased, whose maiden name was Susan Pringle, was born on Pringle Hill, this county, about 1843, being a sister of Mrs. Elizabeth M. Cover, of No. 640 Somerset street; A. W. Pringle, of Wilmore, and Emanuel Pringle, who lives in Maryland. Besides her husband, sister, and brothers, the deceased is survived by five children. Mr. and Mrs. Weaver have made their home since their marriage at Morrison, where the remains will be laid to rest to-day or to-morrow.